ReportsThe South Regional Racketball Closed Championships 2012 took place at Racquets Fitness Centre in Thame on 3rd and 4th March. 36 players, including one lady, battled in four categories and 54 matches over the weekend to win the title of South Regional Racketball Champion and gain free entry into the National Racketball Championships in May. 8 Over 50’s played some great racketball, with 4 of them progressing in the Main Competition and 4 playing in the Plate Competition from round one. In the Plate Semi Finals Competition Wayne Burns and Greg Watts played a close match to decide who would go through to the Plate Final. Burns finally took the match 3/2 (11-8, 4-11, 11-8, 8-11, 11-6), he then met Neville Glaister in the Final on the Sunday. Another close match followed for Burns in the Final, but determined to win, Burns beat Glaister 3/0 (11-8, 12-10, 11-9). In the Main Competition of the Over 50’s, Gerry Burr and Geoff Collins met in the Final after beating their opponents Graeme Slocombe and Alan Walker respectively in the Semi-Finals. Collins played well and made it difficult for Burr to win 3/0 (12-10, 11-6, 11/7). In Grade C a few complete beginners entered, it was great to see their enthusiasm for the game and their eagerness to play. With 6 entries, the grade was split into 2 groups, with the winner of each group battling it out for overall winner. In Group A, Will White sailed through to the Final, winning both of his matches 3/0 against Jake Macklin and Russell Ford. Although Chris Gunn put up a good fight against Anthony Clark, forcing two games to 12-10, 12-10 Clark was the stronger player taking the third game 11-7. With Clark winning both of his matches 3/0 against Gunn and Rebecca Munro, Clark went through to Sunday’s Final. Sunday was a similar story for Will White, as again he sailed through the Final, beating Group B’s winner Anthony Clark 11-5, 11-6, 11-8. Grade B was the largest of the four categories, with 16 players and 22 matches. In the Plate Final, Mark Webster faced Wayne Walker. Webster won the first game 11-6; Walker took the second game 11-5 but was not strong enough to take the next two. Webster won the Plate Final 3/1 (11-6, 5-11, 11-7, 11-8). In the Main Semi-Finals, Chris Backhouse and Matt Compton played a very exciting match, which lasted almost an hour. The first game was close, where at 6-6, neither player could move away from the other until at 12-12 Backhouse took the next two points winning the game 14-12. The rest of their games were also very tight, however Backhouse was just too strong for Compton. Backhouse won 3/2 (14-12, 11-8, 10-12, 11-9, 6-11) taking him through to the Final. 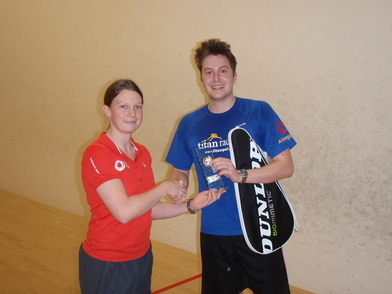 Backhouse met Dave Herron in the Main Final of Grade B, after his closely fought Semi-Final. Backhouse was on fire in the Final, beating Herron 3/0 (11-3, 11-4, 11-6) to take the title. In Grade A there was some fantastic racketball being played throughout the weekend, in particular the final match. With a crowded balcony, and many players who were knocked out on Saturday returning to Thame to watch, Paul Johnson took on the favourite, Tom Phipps in the deciding match to see who would be crowned South Regional Racketball Champion. After a closely fought first game, in which Johnson won 12-10, Phipps stepped up a gear and smashed through the next two games 11-5, 11-4 to win the match 2/1. It was a fantastic weekend, full of exciting racketball matches and some close games. Well done to all who entered and congratulations to all the winners!